Mention the name Howard University, and “world-famous homecoming” probably comes to mind before “world-class studies.” So it was especially disappointing to see a rowdy crowd tarnish the school’s signature achievement by crashing the annual Yardfest hip-hop show. Fest fans were plenty upset that Juicy J didn’t get to perform the Three 6 Mafia’s Oscar-winning song, “It’s Hard Out Here for a Pimp.” Migos didn’t get to do their breakout rap, either. 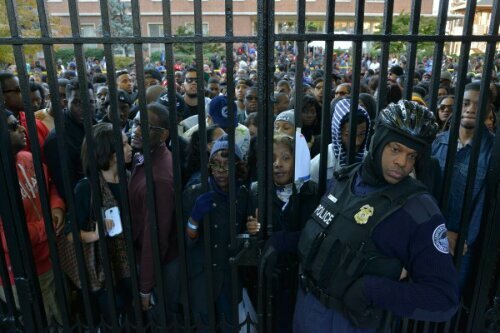 And they call Howard the “mecca” of historically black colleges and universities? Do they think that students make a pilgrimage there to pray? Or do they come to preen and party? Let’s be real. Yardfest is not just some campus concert. It is a rite of passage for up-and-coming rap talent, an occasion for burnishing black culture, a time for rekindling artistic fires and passions by a new generation of black poets. A lucky fan was photobombed by Beyonce as she posed for a picture during her concert in Australia. The 15 year old Beyonce’ fan by the name of Valentina was in the front row of the concert when she attempted to snap a selfie that was abruptly crashed by the Queen Bey herself. Valentina shared her excitement via Tumblr saying, “i dont even know it was such a blur i just remember her bending down to me and my friend and i just turned for the photo and wowoowow it was the best moment ever like she posed its crazy i wasnt even expecting her to look at my phone or notice me in the crowd”. The photo has since gone viral as envious Bey fans and loyal beyhive members posted the pic around the net. Pose for the camera now…Flick! Flick!